The whole world of food likes and dislikes is something that I find endlessly fascinating. I love how complex it all is. I mean there’s a whole lot more at play than just the food itself. It goes way beyond appearance, texture and flavour. There’s history, cultural influences, education a whole melting pot of thing really that makes us choose what we like to put in our mouths and what we don’t. While I’ve never been a particularly fussy eater, there have been things that I haven’t been particularly fond of. But over the years with a little perseverance and willingness to keep an open mind, I have managed to overcome most of my food dislikes sometimes to the point of the food in question becoming a favourite. At times the change has been a result of an outside influence. Take avocado. When I was little we didn’t really have it at home and I remember being on holidays with some family friends who were big avocado fans. For some reason the mother of the avocado family got it in her head that I loved avocado when really I was thinking it was mushy, fatty, green awful tasting stuff. But being a polite child, I didn’t have the heart to tell her that the last thing I wanted to eat was the avocado salad that she had prepared especially so eat it I did and after a few times I found myself really getting into the whole experience so much so that I now consider myself an avocado lover. At other times there were things that I just really wanted to like. Olives and beer come to mind. While it only took a few encounters with the salty olive to get me hooked. Beer was a whole different story. While I did develop at tolerance to it during my first four years at university, it was another few years before I actually could get excited about an icy cold brew. But even so, I tend to only enjoy a beer when it’s really hot and there’s no champagne to drink. Then there are the things that I only started liking after I had had the chance to experience them at their best. Brussels sprouts fall into this category. I remember having them for Christmas lunch at a friend’s place in Bristol in the UK. His aunt had prepared a lovely meal but all I could remember thinking afterwards that she was the most amazing cook because she had actually made brussels sprouts taste good. Peas are another delight that I didn’t get into for years. It took an experience with them at the Lynwood Cafe, super fresh just picked from the garden in a spring vegetable soup, to turn my head. The other day my gorgeous friend Missy Helgs was very sweet and cooked me a lovely dinner. It included of all things a salad with roast beets. Now to say I was surprised and impressed is an understatement. While beets are one of my all time favourites, Missy Helgs is not a fan at all, particularly when it comes to canned ‘rooter’ as she calls it. This lovely gesture got me thinking about my own dislikes. While there are things that I’m happy to leave, like tripe. I am still willing to try it every now and then and could eat a whole serve if it was a matter of national importance. But there is one thing that I DON”T eat: stinky mushy bananas. Maybe it was time to try and overcome my last food phobia? So dear reader, I present you with the recipes for my first three attempts at befriending the banana. The supermoist banana and almond cake is really lovely, although I did dial up the vanilla to cover the banana flavour, I found myself really loving this cake. 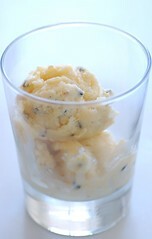 I did struggle a bit with the passionfruit and banana sorbet. The bananas do give it a lovely rich texture, but the banana flavour was peeking through stongly enough for me to have to keep reminding myself that I was in banana reprogramming mode and that it tasted good not icky. I have a confession to make about the smoothie. The plan was to attempt a banana smoothie straight up. But when it came time to make it there was a lovely ripe fig in the fridge just begging to be eaten. What’s a girl to do but cut her smoothie with some sweet, pink figgy goodness. Yum. So I still have a long journey ahead of me before I’ll be pulling into banana central and chowing down on a banana monkey-style. But at least I’m on my way…all good things. Adapted from Janni Kyritsis’ Wild Weed Pie. If ever there was a reason to start liking bananas it’s the divinely moist texture of this cake. If you aren’t a big banana fan just make sure you puree the bananas thoroughly to avoid any sneaky banana chunks ending up on your fork. Preheat oven to 150C. Grease a 22cm fluted flan tin with removable base. Take a large square of baking paper and moisten. Line base and sides of tin with paper. Whizz whole almonds in a food processor until finely ground. Beat eggs and sugar for 10mins or until pale and fluffy. Stir through ground almonds and baking powder. Puree bananas with lemon juice then stir through almond mixture with the vanilla. 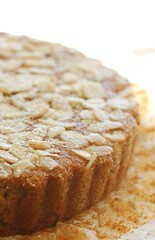 Pour into tin and sprinkle over sliced almonds to cover the surface. Bake 40-50mins or until golden brown and a skewer inserted in the centre comes out clean. Allow to cool in tin. When ready to serve dust with icing sugar and pass yoghurt separately. Adapted from Sean Moran in let It Simmer. The bananas really help with the creaminess of the texture of this sorbet. I made mine in my icecream machine because I am lucky enough to have one but I’m sure it would well if you just popped the mix in the freezer and gave it a little stir every now and then. Sean’s sorbet didn’t have the yoghurt so feel free to make it dairy free if you prefer but I love the subtle tart creaminess that the yoghurt provides. Combine sugar and water in a small saucepan and stir over a low heat until sugar is dissolved. Stir through orange juice and passionfruit pulp. Puree banana in a food processor and add to passionfruit mixture. Stir through yoghurt and refrigerate until well chilled. Freeze in an icecream machine according to the manufacturer’s instructions. Adapted from Rose Bakery Breakfast Lunch Tea by Rose Carrarini. 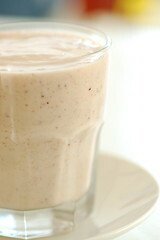 Bananas really do make the best smoothie base. Over theÂ years I’ve experimented with berries and pears and mango but (and I can’t believe I’m saying this) bananas really work best. Feel free to play around with the flavourings. Puree in a food processor until silky smooth. Add water if desired until you have your favourite consistency. Serve immediately. Brilliant pic…can’t wait to try the Janni adaptation … last banana cake I made was from a 1950s Women’s Weekly cookbook and it was dreadful. I’m on the prowl for a new recipe! The first time I had avocado, my mom served it with ice-cream. Ugh! It took me awhile before I got back on the avocado bandwagon and now I’ll never get off it! I have banana smoothies all the time, but have never added figs; unfortunately no fresh figs on this side of the equator for a while. It will be worth the wait. Funny, isn’t it how the older you get the less you resist things like green veggies and fruit? Even olives? Your mum should be proud of you. I’m trying this recipe as soon as possible. That first picture is amazing. I have not made anything with bananas in a while…thank you for all 3, they are great! And kudos to you for not giving upon your dislikes – that’s really awesome. The cake looks great, I’m definetly bookmarking it! Thanks! So much banana-y goodness! Everything looks super tasty! Jules, I applaud your attempts to overcome your food fears. I don’t know if you’ve ever read Jeffrey Steingarten’s, The Man Who Ate Everything, but his introduction to the book is the story of his quest to rid himself of his food phobias — kimchi, dill, swordfish, Greek food, etc. — when he was hired as a food critic. He’s fairly successful, and his success is due to a regimen he devises based on the science of food aversions. It’s fascinating and entertaining, and Steingarten is a glorious writer. That’s my rather longwinded way of saying your post reminds me of that article, and I hope you get a chance to read his books. That said, I’m definitely a banana fan (and an even bigger fan of figs and vanilla, thank you), and these dishes look wonderful. I will have to try both the ice cream and the smoothie when this cold, Canadian winter is a thing of the past. On a separate note, you have a fascinating personal story and an equally charming blog. Consider me your newest fan. no I haven’t read steingarten but he’s on my list. you don’t have to wait until summer for the icecream. am thinking it would be perfect with hot pecan pie or apple crumble…thanks for dropping by. I too, don’t like “raw” bananas – even just thinking about them whilst I write this makes me feel queasy how pathetic is that! – but I can eat “cooked” banana no problem – go figure! 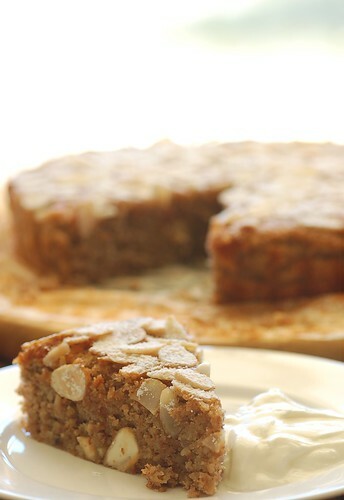 I’m planning on making the almond & banana cake this afternoon – another gluten free sweet thing to add to the repertoire. thanks for the heads up about the photos heather.